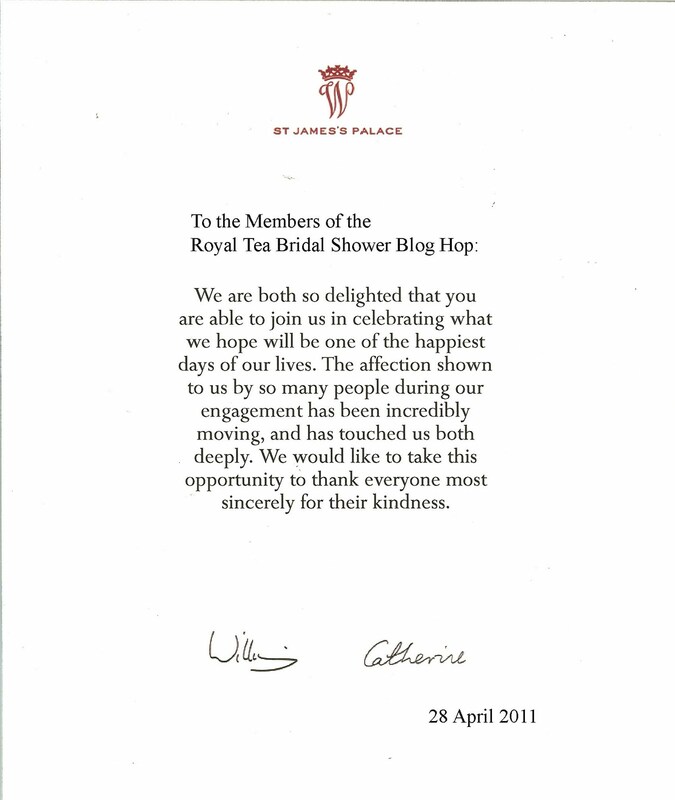 CardMonkey's Paper Jungle: The Long-Awaited Marriage of Blogging with Royalty: The Royal Tea Wedding Blog Hop! 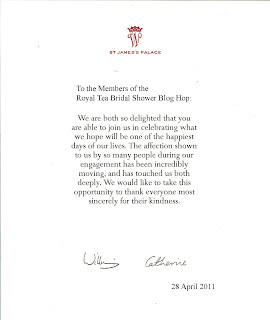 The Long-Awaited Marriage of Blogging with Royalty: The Royal Tea Wedding Blog Hop! Bells of joy ... wedded bliss. 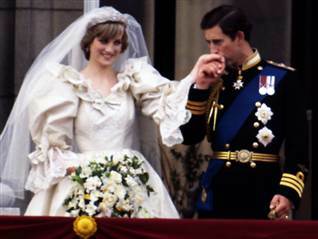 William, the Prince of Wales, has married his Kate, and upon her is conferred the title of Duchess of Cambridge. 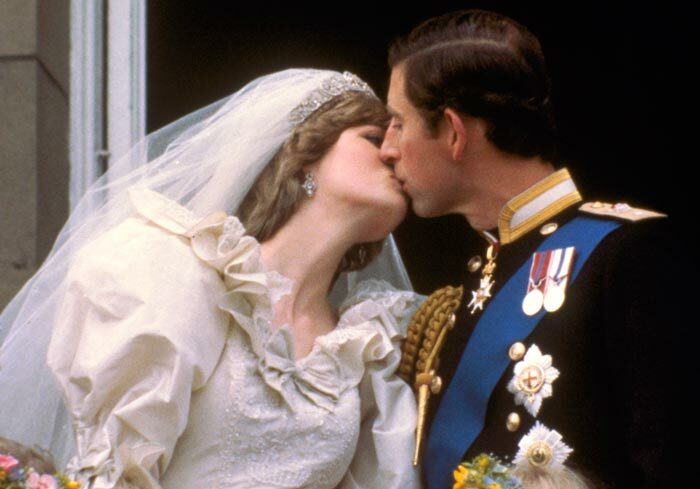 Here you will see some of the finest tea-time projects made in honor of Great Britain's most romantic day since 1981, when Prince Charles married Lady Diana. 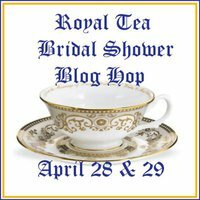 I am so pleased to host the Royal Tea Bridal Shower Blog Hop. Thank you to the fantastic crafters who have joined with me to celebrate the historical romance and wedding of Prince William to his lovely Kate Middleton. The theme of this Hop is anything tea, tea party, royal, bridal or wedding. Judging from what I have seen, there are some lovely creations to get you in the mood to be Royal Watchers. Below you will find the complete list of Blog Stops; please stop by and send some love and wedding rice or bubbles for each of them. 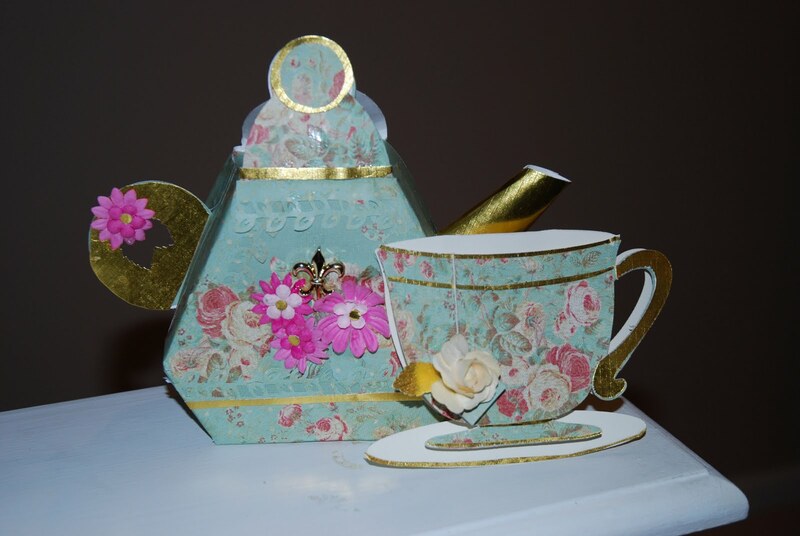 I created this lovely dimensional teapot-shaped box from an SVG file (and Sure Cuts A Lot, with my Cricut Expression) that I purchased from Creations by AR. The pattern is called "Tea Time Tea Pot Box." I modified the design slightly to give a cylindrical spout and wider handle. I used a soft pastel paper to decorate the box (the box/pot is cut and folded from cardstock, to be sturdy). I embellished it with gold metallic trimmed paper, flowers and a fleur-de-lis trinket. 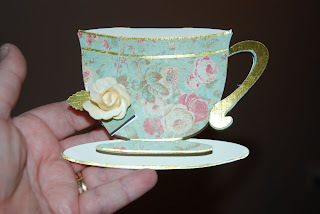 I used the "Tea Time Tea Cup Card" file from Creations by AR to cut what I am using as the party invitation. I cut the file (again, using SCAL/Cricut Expressions) from ivory cardstock and topped it with the floral paper and gold metallic accents. The pattern comes with a slit for a paper teabag and tag; however, I used a real teabag in the slit. I embellished the teabag tag with a handmade rose and a gold metallic leaf. The card opens (cup from the saucer) for the invitation text. Next, I also wanted to decorate fancy tea bags for this beautiful event. 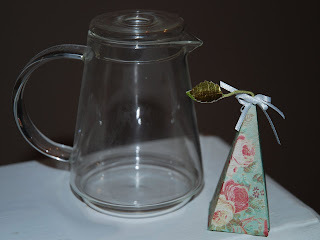 Have you seen these pyramid-shaped silk tea bags from Tea Forte before? One year, when they were an "Oprah Favorite," I grew a new addiction to these fabulous and lovely tea bags. While they have their own wrapper and stem with a leaf, I created a cut file to make these covers that match my tea set. I show it here with a little individual glass teapot/tea infuser that can be purchased from Tea Forte. The Cathedral has emptied ... it's on to the lavish reception! It's time for you to move on to visit the other Hop Stops. But WAIT! Before you go ... what's a blog hop without BLOG CANDY!? The Queen Mother Monkey (all dressed in banana yellow, did you notice?) has authorised me to offer as BLOG CANDY her favorite tiara ... no, the next best thing: A new-in-package CRICUT CARTRIDGE "Mothers Day Bouquet", new for 2011! Here, you'll find so many beautiful flowers that you'll be able to use this cartridge year-round. 2. Leave a comment to this post. Be sure to include in your post a way for me to reach you when you win the cartridge, so I can mail it out to you promptly. International bloggers who win will be awarded an Amazon.com gift certificate of equal value to the cartridge. 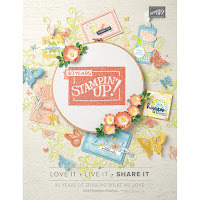 BLOG CANDY BREAKING NEWS: Nicolette, of Beyond Scrappin', has generously donated a tea-time Mug Hugger for a randomly chosen commenter on all the blog stops on this Blog Hop! That means, the more Blog Stops you visit and the more you comment -- one per blog, please -- the more chances you have to win one of these very handy scrap room organizers. I use mine to hold my flash (thumb) drives for my computer. Okay..... Elton John is singing, and you're missing it. Time to move on! Sorry, can't resist sharing this: What's up with the Brits and their hats? This one is on Princess Beatrice. I dare say, it looks like someone used an out-of-proportion SVG file and Pop-Dotted for dimension on this one. Perhaps our next hop should be PAPER HATS!? Please be sure to leave comments, as we all ♥ love, especially on romantic days like this one! Cute idea for a blog hop. Love the Teapot and Teacup. Very pretty papers. Your tea set is very pretty, love the paper you used! I'v been looking forward to this Royal wedding for months. Love this idea for a hop. Your tea pot and saucer are so very pretty. Wow!! Let me pick my jaw up off the floor. This is stunning. I LOVE your teapot & teacup. They are so elegant & perfect for the Royal Wedding. TFS! I forgot to say that I am a follower. Your teapot and cup set is amazing Ellen! Looks like real China! What a fun idea for a hop!!! I will definitely be front and center watching tomorrow morning! I absolutely love the teapot and tea cup they are darling. Great job and thank you for sharing. SO pretty. LOVE that paper. Really looks like fine china. Ellen, you did a Fabulous job on your tea set!!! I love the colors & details of the paper you used! Very Pretty projects. Thanks inviting me to join. Ohhh no front row seat??? I could nudge the King of Bahrain out of the way! 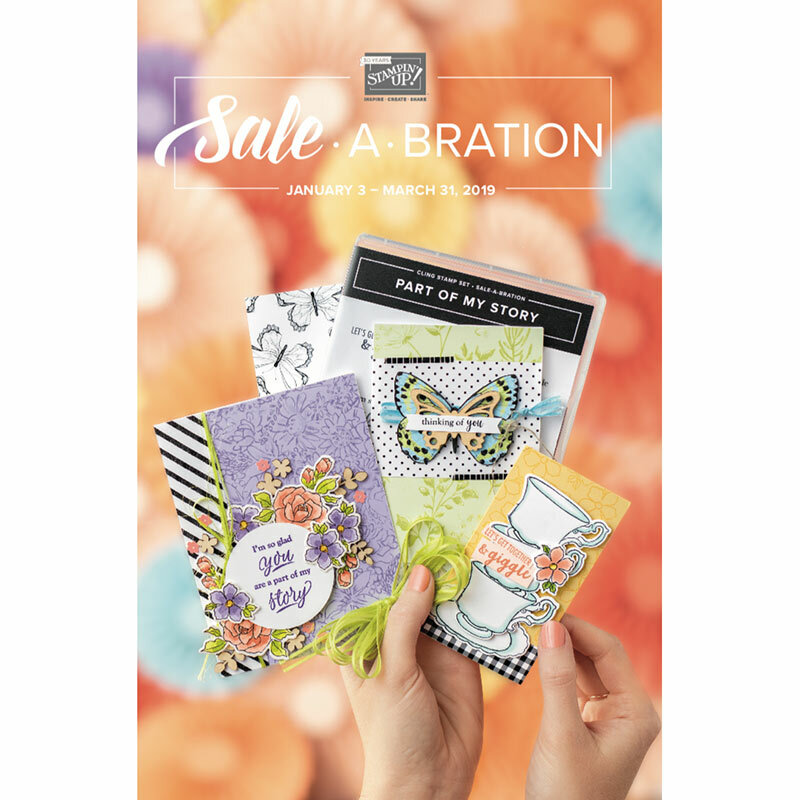 CUTE project, lovely papers and design. Now that I've had a cuppa, time to move on! This will be fun! Thanks. Enjoyed the royal blog hop this morning! Was not able to leave comments on each page, but I'll be back later this weekend when I have time. I adore tea and tea pots so this is right up my alley! very pretty! Love the tea cup and little bags! I am a follower! Great idea for a hop! Beautiful tea set! I love the paper. WOW, that is absolutely beautiful. Fantastic. What a dynamite treasure to mark this royal occasion! TFS! Wow...great teapot and teacup! I have done several tea (etc) swaps and something like this would be SUPER to send with it. Great hop! Following on GFC and Networked. Your teapot looks so delicate and pretty. I love the paper you chose. Great idea for tea bags! TFS/ Already a follower. Please forward my Thanks to the Queen Monkey for offering an awesome blog candy. Ellen, you are so much fun and your projects and ideas are great. Very cute! So appropriate for the theme! Beautiful! What a great project, Ellen! I can't wait to see what the other talented ladies have created. I love it. Great minds think alike. Gorgeous colors. Thanks for hosting the hop. Love your tea set. Very pretty. Thanks for a chance to win!! Loving this hop!! Wonderful project! The papers you used are SO perfect! Beautifully done! I love your teapot and cut and the paper you used. Beautiful! OMG! These boxes are just so amazing and I must say very elagant! Your true talent came through with this project! Beautiful!!! Thanks for sharing and for putting on this fun bloghop. Thanks for the great idea and sharing! I'll be up at 4 to watch, just as I did when his mother and father married. I so wish we could be together, sipping tea and sighing over the wedding. I do think my wedding invite got lost in the mail--after all, I had the foresight to name my children William and Kathryn! I just love your teapot and cup--I collect vintage teacups, and had to look twice to see that yours were made of paper! I'm a follower--you can find me at ksjennings at gmail dot com and/or www.kareljcreations.com Please pray for the tornado victims. I love your tea set! I'm looking forward to the rest of the blog hop and watching The Royal Wedding! What fun! I love the tea theme here. Tea cups are so wonderful. I just became a follower and now I'm off to hop along the blog path! Thanks! WOW!!! What an Amazing job you did on your Tea Set. Just Gorgeous. What a fun hop this is. I have been looking forward to watching the Royal Wedding. Praying for them to have a long and happy life together. Thank you so much for the chance to win your wonderful Giveaway. Awesome idea for a blog hop! I am looking forward to the wedding. your creation is so amazing! Great job! I am now following you! My mom LOVES tea!! This is so beautiful!! Thanks! Love your royal project. Tea is the best! Glad to be part of this hop today! Wow, i love your dimensional Teapot and teacup. So pretty and perfect for a Royal Tea!! Love it! Love the colors you used for the projects. Beautiful for a royal tea party! Oh Dahling, what a lovely set of tea cups you have here. Delightful it is to have run into you. We shall meet again soon. very royal looking indeed, that is gorgeous, great take on your blog hop!! I love the tea pot and tea cup.. so adorable. I am following through email. ADORABLE teacup! And what a royally fabulous idea for a blog hop! I am already a follower of your delightful blog! So I'm going to grab a cuppa and sit on my royal keester and enjoy this royal blog hop! I am now a follower. super cute card. Lordy this is devine, I feel like raising my pinky finger now....and I have only just started this hop!! What a beautiful, elegant tea set. Reminds me of my grandmother's fine china pieces that were so lovely and fragile. The perfect tea set for such a wonderful day. Your papers are beautiful. I'm new to your blog and am really inspired by your work. TFS!!! and a great oppurnity to win some candy. That is SOOO cute!!! Love the colors too! I'm a new follower! I LOVE your tea set! It's so pretty and creative! Beautiful projects!! I must be part English because I love a good cup of hot tea and I love anything that has to do with tea cups! I was so excited when I started to read front row seat! lol! Your tea set made me absolutely thirsty my dear! Just love it! What a beautiful tea set for a beautiful theme blog hop. Very nice!! I'm already a follower. What a fun way to celebrate the royal occasion. So cute! OMG what a beautiful project! It is truly fit for royalty! What a fun blog hop! Love your elegant teacup and teapot. Adorable tea party projects. I am a new follower and cant wait to see what you come up with next. Thank you for sharing and the chance to win. Lovely Tea pot and cup. Love the tea bag covers. Thank you so much for inviting me to the royal tea party. You never cease to amaze me!!! We definitely have to get together and you can teach me about SCAL and I will show you the Pazzles :) Thanks for organizing this AMAZING hop! Is it teatime already? Great projects! Love the theme! Totally love your tea set! So creative! I became a follower of your blog too. Love this excitement -- and the tea pot and cup are absolutely "british" to a "T". Such fun! Thaks for this opportunity. I have become a new follower! Great hop!!! I've already had a ton of comments!!! !great project! Love it! Beautiful colors on the tea pot & cup! I am now a follower! I love your blog. Also love you tea set you made. It's darling! Your tea pot and tea cup are fit for royalty! I've become a follower and I'm off to the next blog. I can be found at wleitel.blogspot.com. Absolutely LOVED your paper and tea cup and pot idea!!!~~! I am here for day 2 of the Hop...missed the ceremony....:O(. But my daughter was having a ceremony of her own at school this morning....Academic Achievement Award! Way to Go Princess! Love your royal project, thx for doing this fun hop! I loved the whole wedding! Oh the Queen snubbed Camilla. The dress was amazing, am going to watch it again! That is the most adorable teapot. I have the perfect place to display that! Ellen, this tea set is so beautiful!! I love it :) The papers are so elegant, and the set looks like china! I just had a blast being a part of this blog hop-great idea, and thanks so much for having me!!!!! I saw the wedding today, kate looked stunning. 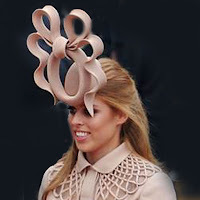 Love your project and don't love the hat on beatrice to. sure looked popdotted ihihi. That set was very FAB!! Your choice in paper really made it work. And they do love their hats don't they! Makes me want a drink of tea right now..lol yes your project is divine!! Such talent!! Thanks for doing this fun hop. How pretty your teapot and cup is. Very sweet idea!--Pat N.
That is just so sweet, love this idea of a hop! This is such a gorgeous set! I really love how you made the tea bag box too!